saved for the rarest of smoke breathers and tunnel divers. regions. Uncomfortably. I look anywhere but forwards. takes his seat when we stop at the Bear Pit. I am forgotten. shift. The spotter’s gaze moves to a new interest. Stephen Lightbown was born in Blackburn, but now lives in Bristol. Stephen experienced a life changing accident when 16 and now writes about his experiences as a wheelchair user. He can be found on most social media channels via @spokeandpencil and in 2019 Stephen’s first poetry collection, Only Air, will be published. 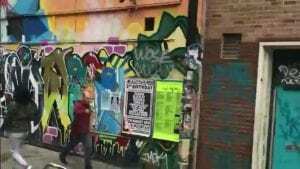 This film was filmed on a mobile phone on location in the Stokes Croft area of Bristol. It is an edit of one continuous shot of a ten minute bus journey where the camera takes the point of view of the protagonist in the poem. 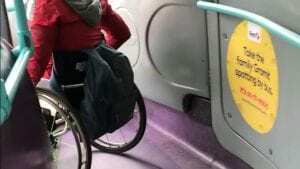 Travelling on public transport can be an odd experience if a wheelchair user particularly the interactions with other passengers. On more occasions than is acceptable I have found my stared at and observed just because I am travelling alone. This is an odd experience and one I wanted to share through the short film.